Football season is in full swing. Fans are already riding the roller coaster of emotional highs and lows as their teams win or lose. At the tailgate parties fans are toasting their teams' triumphs or drowning their sorrows. Regardless of the outcomes, they will return each week to the stadium to watch their teams play. They will dress in team jerseys, or they will mark themselves as diehard fans and go shirtless, wearing only the paint of their team colors. And as sure as we see a fan who has painted his face with the team colors, we will see a fan holding a placard bearing a familiar citation: John 3:16. Fans will find places in the stadium where the verse with get the most exposure. But what we don't seem to talk about is the message of John 3:16. Many Christians can recite this verse from memory, "For God so loved the world that he gave His one and only Son, that whoever believes in him will not perish but have eternal life." In some ways this verse has become so familiar that people rarely give thought to its meaning anymore. As we do with so many Bible verses that we like, we deposit this one into our emotional bank of good feelings and withdraw it when we need it. We relish the warm fuzzy feeling we get from knowing that God loves the world. 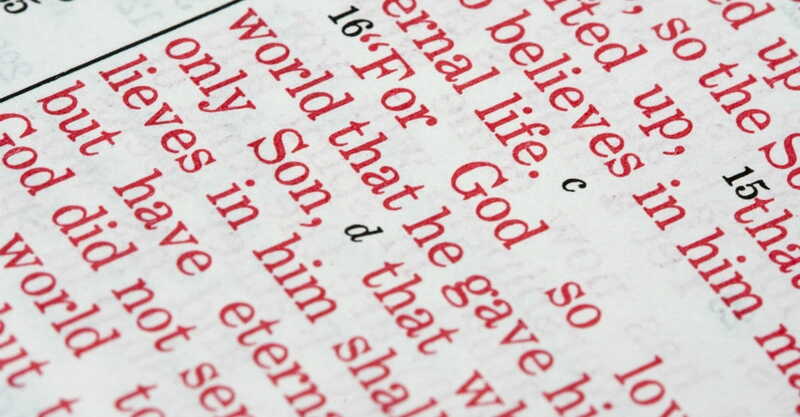 For many people John 3:16 reads like a Hallmark card sent from God. In fact, when some Christians speak of the Gospel they use a play on the words of the Hallmark corporate slogan: "God cared enough to send His very best." But John 3:16 is not a message of sentiment. When God sent His Son into the world, He was not having an emotional response to the tragedy of sin. God, "in the beginning," (Genesis 1:1) had already made up His mind that sin would be dealt with in the work of His son, Jesus Christ. Basically God gave us a piece of His mind in the sending of Christ. And Christ made up His mind to complete God’s work of salvation in the world on the cross. He explained to His disciples that “He must go to Jerusalem and suffer many things” (Matthew 16:21). John 3:16 reveals the mind, will and divine purpose of God. His love for us does not stem from a warm feeling He had for the world. God chose to love us. He decided to love us. His love is an act of His will, and the way He chose to love us was through His Son. In this verse we see the specifics of God’s plan for salvation. Sometimes, it’s in the little words that Christians can extract the greatest meaning. The meaning of the word “For” is such a word here. When we look closely at this little word—we find a big meaning: "in order to save" (Dictionary.com definition 20). From all eternity, God's intention has been to save the world. And the ball of salvation and redemption was already rolling at the first dawn of the universe. Revelation 13:8 states that the book of life belongs to “the Lamb that was slain from the creation of the world.” Hebrews 4:3 asserts, “And yet His work has been finished since the creation of the world.” And the Gospel writer John reveals, “In the beginning was the Word and the Word was with God and the Word was God” (John 1:1). The Son did not become the Savior in reaction to Adam’s sinning and being swallowed up by death. The Son was already Savior before the world began. Jesus willingly and joyfully took on the means of salvation. Through His Son, God created and redeemed the world on the first day of creation. The light of the new day was the dawn of redemption. When Adam sinned, redemption was already offered to the world. But the world rejected the offer. To save the world from sin and death God chose to make His Son the Savior, and His Son gladly complied with His Father’s will. Now the world needed to know that salvation through the Son was possible. So the truth of Christ’s sacrifice had to be made visible in the world. In making visible the plan of salvation, God voluntarily placed His Son in the body of a man, Jesus Christ, and placed Him in the enemy territory of the fallen world. He was “Immanuel, God with us” (Matthew 1:23). Out of His love for the Father, Jesus Christ, willingly placed Himself into the hands of the enemy, who is sinful humanity, to go to the cross to carry out the divine will of God. Everything for salvation that had been on the mind of God on behalf of fallen humanity was now going to be made visible for all the world to see. Humanity could witness this choice of love that the Father had made to redeem all of creation from human sin. This intentional plan was the way God chose to love the world. To let His Son become a man and die on the cross as an atoning sacrifice for all human sin. Jesus carried in His body the sin of every human who ever had or would live, so all who believe in Him could receive forgiveness, mercy and redemption. John 3:16 reveals the mind of God and His loving choice to save the world from sin and death through the Godman, Jesus Christ, who has redeemed us through His life, death and resurrection. Denise Larson Cooper has a passion for Christ and sharing His Word. She is an avid walker and spends many hours in the great outdoors admiring God’s creation. She also enjoys photography, leads small group Bible studies and invests the Gospel in all she does. Denise graduated with a Masters of Divinity from Asbury Theological Seminary and worked ten years of inner-city ministry in Rochester, New York. A wife and mother of two daughters, Denise currently works as a gymnastic coach. For Daily Devotionals from Denise, follow her on Facebook.